The Bureau of Labor Statistics reported the Consumer Price Index for All Urban Consumers (CPI-U) jumped 0.6 percent on a month-to-month basis in August 2012. This ended a four-month streak in which the CPI-U was either unchanged or declined, plus it also marked the largest percentage change in overall consumer price levels since mid-2009. Energy prices accounted for the bulk of last month’s increase in CPI as the energy index surged 5.6 percent from July 2012. The index for gasoline climbed 9 percent on a month-to-month basis, with the EIA indicating that the national average retail price of all grades rose from $3.50 to $3.78 per gallon. Energy prices could bolster the reading for the September CPI report as gasoline and diesel fuel prices continued to increase during the first half of this month. Core CPI, a measure that excludes volatile food and energy prices, increased approximately 0.1 percent compared to July 2012. Despite seeing sequential gains in the past 31 months, core CPI still points to a very tame rate of inflation in non-food and non-energy goods prices. Indeed, year-over-year rate of growth during August 2012 was 1.9 percent, representing the slowest rate of core CPI growth since mid-2011. The shelter index, which serves as an approximation for housing costs, increased for the 28th month in a row; however, just as in all the previous months, these gains have been modest at best and the shelter index has increased 2.1 percent on a year-over-year basis. In terms of rental housing costs, NAHB constructs a real rent index using the CPI for rent of primary residences and the topline CPI. According to this measure, real rents declined 0.4 percent in August 2012, representing the largest decline in more than a year. 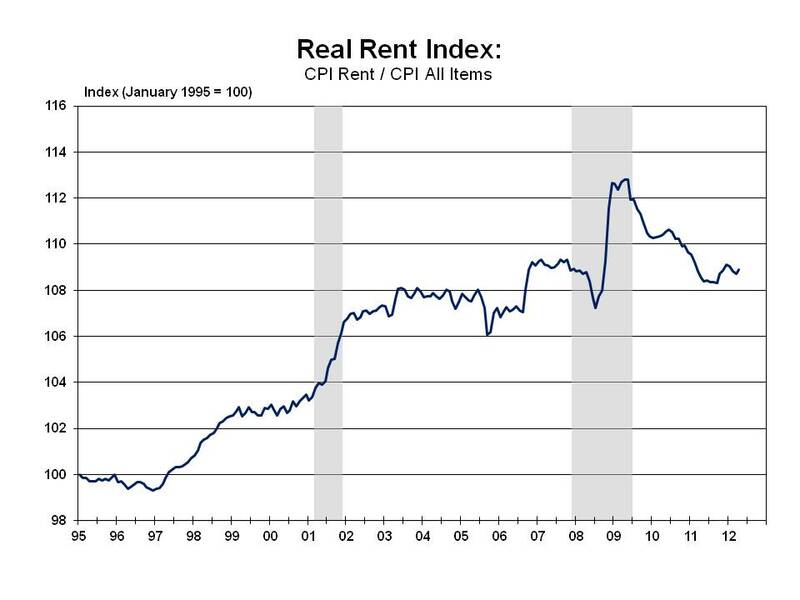 Last month’s decline in the real rent index is a direct result of surging energy prices causing overall CPI to increase at a much faster rate than rents, which have risen at a fairly modest pace for quite some time. The Bureau of Labor Statistics reported that the Consumer Price Index for All Urban Consumers (CPI-U) held steady in July. Overall, the CPI-U has remained either unchanged or declined in each of the last four months. Energy prices slipped 0.3% in July, putting more downward pressure on topline CPI. The next couple of months of readings on overall CPI will likely be stronger, however, as gasoline and natural gas prices have surged in recent weeks. Core CPI, a measure that excludes volatile food and energy prices from the calculation, posted its smallest month-to-month increase since September 2011. Year-over-year growth in core CPI still points to a very tame rate of increase in non-food and non-energy price levels, with the latest reading of 2.1% the third consecutive month this metric has decelerated versus to its year-ago level. The shelter index, which serves as a crude measure of overall housing costs, rose for the 28th consecutive month; however, each of those increases have been modest (including the 0.1% gain in June), leaving the shelter index only 2.1% above its year-ago level. In order to more closely assess trends in rental housing costs, NAHB constructs a real rent index from the CPI for rent of primary residences and overall CPI. This metric has registered four consecutive month-to-month increases, with the latest gain coming in at 3.3% on an annualized basis. For the second time in three months, the Consumer Price Index for All Urban Consumers (CPI-U) remained unchanged from the prior month’s reading. 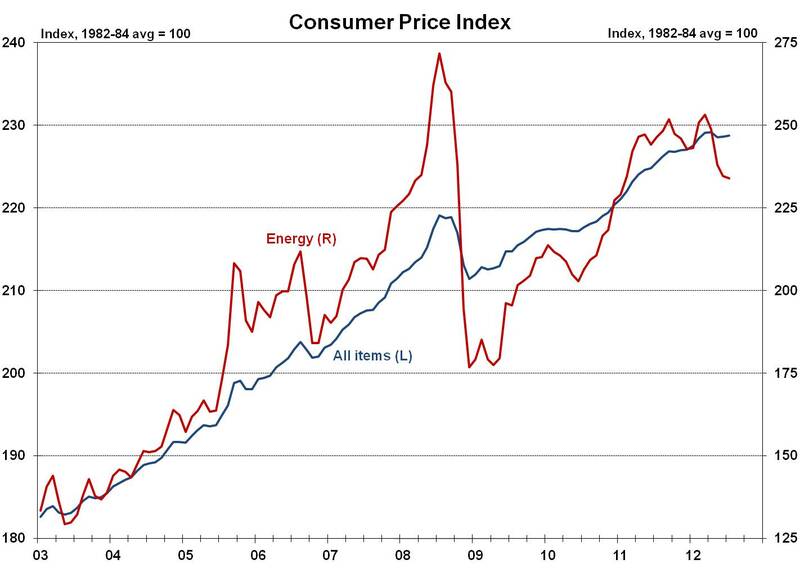 Once again, energy prices weighed on topline CPI as the energy index fell for the third month in a row, contracting 1.4% from May 2012 and 3.9% versus June 2011. Gasoline prices fell throughout the month of June, closing out the final week of the month around a national average of $3.42 across all grades. The index for natural gas offset the drop in gasoline by posting a 1.7% increase in June. The downward pressure on the overall price level caused by gasoline prices will likely slow or even possibly come to an end over the near term, as prices at the pump and wellhead have risen appreciably over the past several weeks. Core CPI, a measure that excludes volatile food and energy prices, increased 0.2 percent month-to-month in June. This marks the fourth consecutive month the core CPI has advanced at this rate and the index has increased at an average monthly rate of approximately 0.2% since the beginning of 2011. On a year-over-year basis, core CPI registered a 2.2% rate of growth, slowing slightly from the 2.3% rate observed the previous four months, but still above the 1.9% average annualized rate of increase seen over past decade. The shelter index, which is used as a measure of housing costs, continued to rise steadily in June as it increased 0.1% from the previous month and 2.2% on a year-over-year basis. 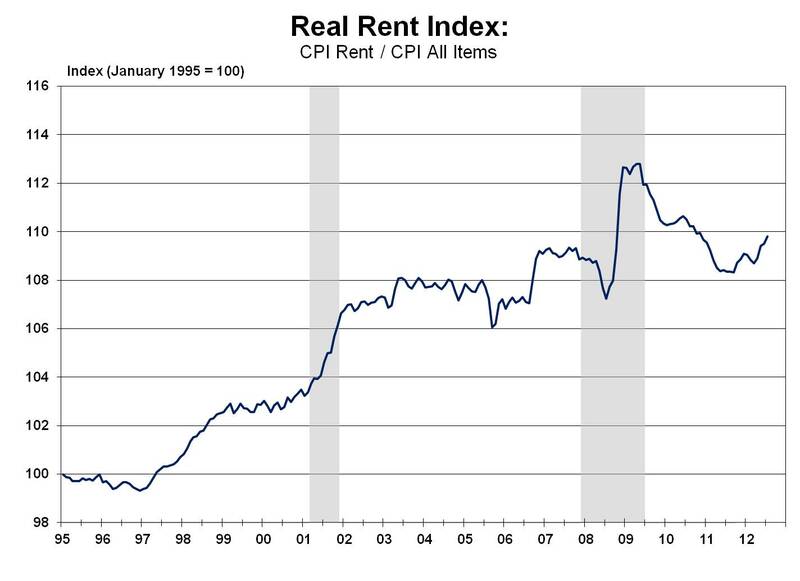 In terms of rental housing, NAHB constructs an inflation-adjusted measure of rental rates from the CPI for rent of primary residences and overall CPI. The real rent index increased for the third month in a row and is approximately 1% above its June 2011 level. Today’s release for the Consumer Price Index for All Urban Consumers (CPI-U) showed a 0.3% decline between April and May 2012. The energy index accounted for most of the drag on topline CPI last month, falling an additional 4.3% after a 1.7% drop in April. The latest decline represented the largest percentage contraction in the energy index since December 2008—a time period in which energy prices were falling sharply in response to the deepening recession. Gasoline prices contributed significantly to the decline in the broader energy index, averaging $3.79 over the course of May, a 4.2% decline from April. Prices fell throughout the month of May and have trended lower through the first two weeks in June ($3.63 nationally as of 6/11), which points to additional downward pressure on the energy index and overall CPI. Core CPI, which excludes the often-volatile food and energy goods, increased 0.2 percent month-to-month in May, roughly the same rate of growth it has averaged since the beginning of 2011. On a year-over-year basis, core CPI advanced 2.3% for the fourth time in the last five months. The shelter index, which serves as a proxy measure of overall housing costs, maintained its slow and steady march higher by increasing 0.2% on a month-to-month basis for the 11th time in 12 months. For rental housing, NAHB separately constructs a measure of real rental rates from the CPI for rent of primary residences and overall CPI. On an annualized basis, the real rent index jumped 6 percent in May, based on a trend-like increase in rents coupled with the sharp (annualized) decline in overall inflation. In addition, this marked the largest percentage jump in this metric since late 2008. The Bureau of Labor Statistics reported today that the Consumer Price Index for All Urban Consumers (CPI-U) was unchanged between March and April 2012. Energy prices played a major role once again in shaping the CPI’s trajectory, but this month it put downward pressure on the overall CPI as the CPI for energy slumped 1.7 percent versus March. Gasoline accounted for the bulk of the decline in the broader energy CPI, even though retail gasoline prices actually peaked nationally at nearly $4.00 per gallon during the week of April 9th. Prices eventually declined 11 cents in the final three weeks of the month, which could have influenced this downward movement in the energy index. With retail gasoline prices falling appreciably in most parts of the U.S. over recent weeks, gasoline could weigh on the overall CPI for May. Natural gas prices continued to pull the energy component of CPI lower. Indeed, the spot price for natural gas averaged $1.95 per MMBTU during April—the lowest level observed since March 2009. Core CPI, which excludes food and energy goods, increased 0.2 percent on a month-to-month basis in April and rose 2.3 percent versus April 2011. Year-over-year increases in core CPI have generally inched higher over the past 19 months, but at 2.3 percent the rate of growth in core CPI remains quite tame. Housing costs, as measured by the shelter index, continued their gradual march higher by climbing 0.2 percent for the 10th time in the past 11 months and increased a modest 2.2 percent compared to April 2011. With prices for single-family housing beginning to stabilize, rental costs have become a point of focus as households make the decision between owning or renting and as available apartments have become scarcer in recent quarters. NAHB’s measure of real rental rates is constructed from the CPI for rent of primary residences and overall CPI. This index increased 2.1 percent on an annualized basis in April and registered its first year-over-year increase since October 2009. 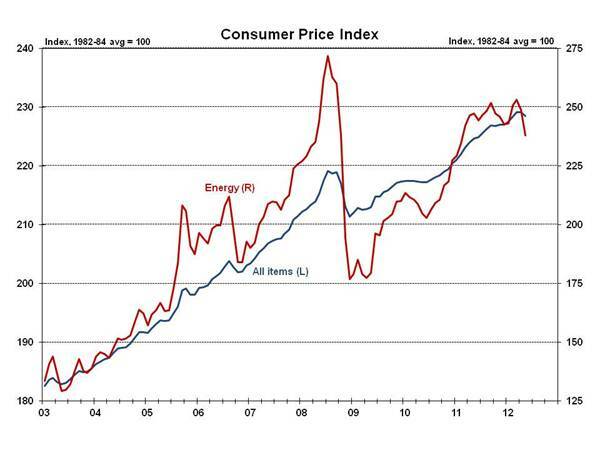 Relatively stronger increases in energy prices had masked the impact of rising rental rates in recent months. 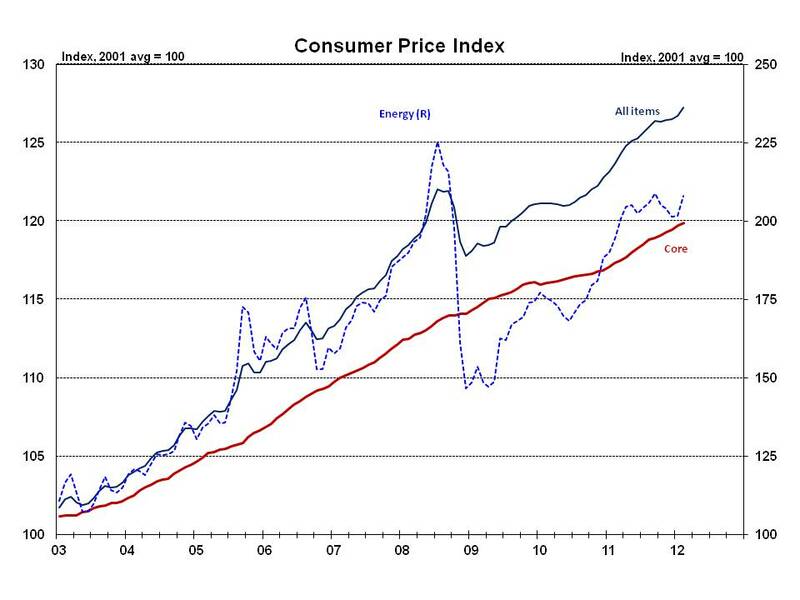 The Consumer Price Index for All Urban Consumers (CPI-U) increased 0.3% on a month-to-month basis during March 2012. Once again, energy prices boosted the topline reading on the month-to-month change in price levels, as the CPI for energy jumped 0.9%, after registering a 3.2% increase in February. Retail gasoline prices averaged $3.91 nationally (across all formulations) in March, surging 7.4% versus the previous month. In addition, this marks the third highest monthly reading (in current dollars) for gasoline on record. Prices at the pump have risen an additional 9 cents over the first two weeks of April and the U.S. Energy Information Administration anticipates prices rising further ahead of the Memorial Day holiday. While gasoline prices have exerted some upward pull on overall CPI, natural gas prices have offset this impact to some degree. In fact, the spot price for natural gas recently fell to its lowest point since October 2001 as inventories are seasonally abundant and demand remains weak. Meanwhile, core CPI, which excludes food and energy goods, increased 0.2% from last month and gained 2.3% on a year-over-year basis. The largest gains were observed for used cars and apparel, but all major categories that make up core CPI experienced increases between February and March. The shelter index, which serves as the broadest measure of housing costs within the CPI, posted a 0.2% increase during March—the same rate of growth that occurred in the 5 prior months. On a year-over-year basis, the shelter index increased 2.1%. With the multifamily sector performing relatively well compared to the single-family side of the market, rental rates will likely become an important issue as households make the calculus between owning and renting. NAHB’s measure of real rental rates, which is constructed from the CPI for rent of primary residences and overall CPI, fell for the third month in a row during March. While this result suggests apartment demand might be weakening, the recent slippage in the real rent index is likely a result of surging energy prices pushing overall CPI up faster rate than rents.